The capital city of the Emerald Isle, there’s plenty to see and do whilst you’re in Dublin. Whether you’re looking to immerse yourself in the city’s celtic culture, or take advantage of some of the most highly-rated tourist attractions in the whole country, then Dublin is the spot for you. As the heartland of the Irish republic, Dublin’s history spans the ages, and there are a multitude of historic buildings, attractions and areas that are worth a visit whilst you’re in town. Most of the attractions are best reached in your holiday hire car, which is the perfect way to take in your stunning surroundings as you make your way around the city and its neighbouring counties. Book direct and collect at our Dublin Airport branch. 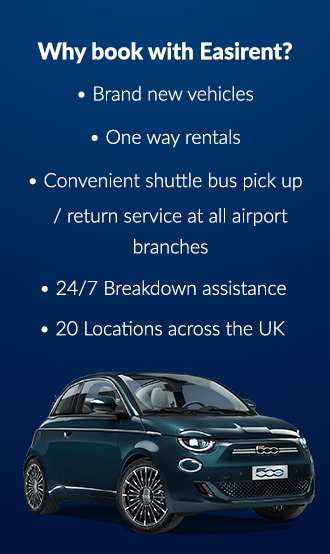 Our friendly staff will be on hand to help for any car hire questions you might have. The stronghold of British power for over 700 years, Dublin Castle is the perfect place to visit to learn about the history of the country of Ireland and its journey to becoming a republic. Situated on Grafton Street in the heart of the city, Dublin Castle began its life as an Anglo-Norman fortress which was commissioned by King John in 1204; only one tower remains of the original castle – the Record Tower – the rest of the castle dates back to around the 18th century. Yet, it’s definitely still an impressive feat of architecture and certainly worth a visit. Entrance to Dublin Castle is through the Dame Street entrance, and on arrival, you’re greeted with several different styles of Irish architecture. On your left, as you enter the grounds of the castle, is the Victorian Chapel Royal, a stunning architectural feat which sees over 90 heads of Irish parsonages carved from Tullamore limestone, and makes for an impressive start to your visit. This part of the castle is usually included in the official guided tours, so make sure you don’t miss out on this part of the castle when you’re booking your tour tickets. Following this part of the castle, you’ll find the Record Tower, the most original part of the castle – however, this part is inaccessible to the public as it awaits a long-overdue renovation. Past this you’ll find the oldest office block in Dublin – the Georgian Treasury Building, and beyond that, the Revenue Commissioners Building. The grounds of Dublin Castle are so diverse that you could quite easily find yourself spending a day here, taking your time to soak up the Irish history and heritage. Today, Dublin Castle is utilised by the Irish government as a space for meetings and functions, but tourists are welcome to visit the grounds and take part in either a guided tour – which will last around 70 minutes – or a self guided tour, which is made easier by the accompanying tour guide booklets, available in 17 different languages. A visit to St Stephen’s Green is the perfect way to take a break from exploring the city in your rental car and allows you to stretch your legs surrounded by stunning, lush greenery. One of the city’s prettiest public parks, St Stephen’s Green was designed by William Shepperd and officially opened to the public in 1880, in a grand ceremony performed by Lord Ardilaun. Adjacent to the city’s main shopping street – Grafton Street – the park is the largest of Dublin’s parks, coming in at 22 acres. Several key features of the park draw in a multitude of locals and tourists alike on warm sunny days, and it’s the perfect place to take the kids for a runaround and a play in the park’s play area. It’s within St Stephen’s Green that you’ll find a memorial garden dedicated to the famous Irish poet and author, W B Yeats, and a commemorative sculpture created by Henry Moore. There’s also a fountain which represents the ‘three fates’, and can be found inside the Leeson Street entrance gate. Designed by Joseph Wackerle in 1956, the bronze statue was a gift from the German people as a thank you to the Irish people for their help towards refugee children following World War II. Around five hundred German children stayed in Irish foster homes during the second world war, through a project called Operation Shamrock. Best known through its important involvement in the Easter Rising of 1916, Dublin’s General Post Office is still in operation today, and stands as a memory of the Irish struggle for independence. With bullet holes still visible on the external walls of the building, the post office is a site of great pride in the city, and welcomes visits from thousands of tourists and visitors each year. Today, the General Post Office is the headquarters of An Post, the Irish Postal Service, and it is Dublin’s principal post office. Worth a visit just to marvel at the architecture alone, the post office stands proudly on the main thoroughfare of Dublin – O’Connell Street – and has a beautiful facade of six fluted ionic columns. A former prison-turned-tourist attraction, Kilmainham Gaol is a museum which is run by the Irish government, and acts as a reminder of those imprisoned and executed, for taking part in the Easter Rising of 1916. Decommissioned as a prison in 1924, and tainted with the perception that it was a place of oppression and suffering – especially towards female prisoners – the gaol went through a transition period, where many officials argued over what to do with it, ranging from reopening it as a functioning prison, to demolishing it and rebuilding on the land. However, after falling into a state of disrepair after years of neglect, Kilmainham Gaol became the subject of a grassroots preservation movement in the 1950s, which sought to bring the site back to its former glory, and act as a museum. Visitors to Kilmainham Gaol can expect to find a comprehensive history of the struggle for Irish independence, and it is today regarded as one of the most important historical buildings in the city due to its long narrative and role in becoming a republic. Kilmainham Gaol has also been the backdrop for many iconic films, including The Italian Job, The Face of Fu Manchu and The Whistleblower. Hop in your holiday hire car and head west of the city centre to Phoenix Park, an urban park spanning 1750 acres on the outskirts of Dublin. Home to herds of wild fallow deer, acres of grasslands and stunning tree lined avenues, Phoenix Park is the one of the largest enclosed recreational spaces in any European city. Spanning three civil parishes, Phoenix Park has many draws for different people, and probably its most famous feature is Dublin Zoo, which sits inside its walls. Home to over 700 species of animals, Dublin Zoo is a great day out for the whole family. Originally opening to the public in 1831, it is the third oldest zoo in the world. Other features of Phoenix Park include the Wellington Monument, a publically funded obelisk commemorating the victories of the Duke of Wellington, and is the highest obelisk in the whole of Europe. Designed by Robert Smirke, the obelisk would have been even higher if the public funding hadn’t run out during the construction. If you want to explore the park and get some well deserved exercise and fresh Irish air, make sure to head to the Magazine Fort, which sits on the southeast side of the park, and is the site of the former Phoenix Lodge, which was built in the park in 1611, but later demolished and replaced by a powder magazine in 1734. The park itself is the home to abundant forms of flora and fauna, and to date there are 351 identified plant species – three of which are extremely rare. There are wetlands, grasslands, and 30% of the park benefits from tree cover. The perfect environment for the 400 or so fallow deer which were introduced to the park in the 1660s, and still call the park home, today. A five kilometre drive northwest of Dublin city centre in your holiday rental car, will bring you to the beautiful National Botanic Gardens. Founded in by the Dublin Society in 1795, the gardens are today home to 20,000 living plants, and millions of other dried plant species. Each year, the gardens take part in national and international initiatives for biodiversity conservation and sustainable development. The National Botanic Garden is Ireland’s seventh most visited tourist attraction, and the second most visited free attraction in the whole country, so it’s definitely worth a visit if you’re in the area. Within the gardens, there are plenty of glasshouses of architectural significance, including the stunning Palm House and the Curvilinear Range.